Dr. Julie Devereux is an outspoken advocate for the right to die –until a motorcycle accident leaves her fiancé, Sam Talbot, a quadriplegic. Sam begs to end his life, but Julie sees hope in a life together. With the help of an organization that opposes physician-assisted suicide, Julie has Sam coming around to her point of view when he suddenly dies from an unexpected heart attack. An autopsy reveals that Sam died of an unusual heart defect, one seen only in those under extreme stress –in fact, it appears that Sam had been literally scared to death. As Julie investigates similar cases, she finds a frightening pattern…and finds herself the target of disturbing threats. The more cases Julie discovers, the more the threats escalate, until she is accused of a mercy killing of her own. To clear her name and save her career, she must track down whoever is behind these mysterious deaths...but time is running out as someone has decided that killing Julie is the only way to stop her. 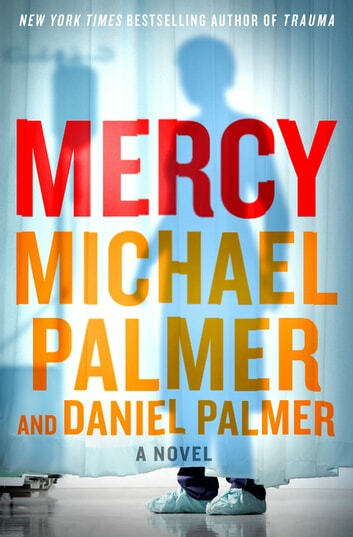 A riveting medical thriller, Mercy will leave readers breathless with twists and turns leading up to its explosive conclusion, from New York Times bestselling author Michael Palmer and his son, acclaimed suspense novelist Daniel Palmer. A very good thriller! It's suspenseful and you really don't understand the true story until the end. Loved it!! Very well written, could not put the book down. Love medical mysteries. Quick read. excellent develoment of characters. b Being in the medical field the terminology and hospital references were realistic and well researched for current day.